Looks like it’s made to accommodate Jolts. Stealth Striker Set - $19.99 – The battle harness, drop leg, and…. Something else. Not sure what it looks like. Mobile Gear pack - $19.99 – Battle Harness sold with the Starter Strike items. FALL 2018 - BUILD A BUNKER CUBES. Yes, Nerf is making their own inflatable cubes. You can stack and attach with Velcro, and a starter kit will contain 3 cubes. The cubes are maybe 3’ high, if I recall correctly (don’t quote me on that) and are pretty well built. I think it’s a heavier vinyl they are made of, and there’s a notch in the top to act as a barrel rest. Jazwares is fashioning 4’ tall bunker supports that will have some Nerf branded camo netting draped between them. The supports will be inflatable but it looks like the bunkers will make a cover 4’ High and 7.5’ Wide. Complete with notches in the top for blasters to rest and holes to peek at the competition through. 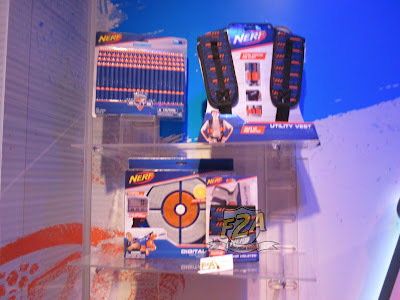 Looks like Nerf was paying attention during all those #Stockpile Saturdays, they’re finally making a blaster rack. Complete with side hooks, a main storage bay to rack blasters, shelving and a drawer, the set looked pretty cool. This was considered an “introductory” set, so plans for more could be in the works. The height of the initial set I saw was maybe 2-3 feet (tall enough to hold an AlphaHawk) and wide enough in the main spot to hold maybe 6 Retaliators. REALLY cool look, plastic but with a metal rack aesthetic. Again, no pics were allowed! This is the best I can do, and thanks to Jazwares for letting me publish it! See you on the other side, Nerf Nation.